Today I had the most fun I have had in a long time! My son, Cole, had to have a venous filter removed from an artery (I believe I mentioned it in an earlier post). 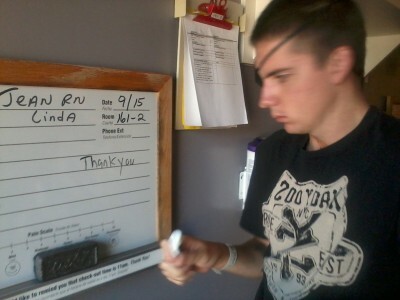 So he had a scheduled appointment today at Mission Hospital, for this outpatient procedure. We received our prep phone call yesterday; telling us to arrive at 9:00a.m. for pre-op and then the surgical procedure would happen at 11:00a.m. and than he would stay for observation 2 hours post the procedure. Now of course, as is customary with any surgery, it was advised to abstain from food and all liquids after midnight. Not too difficult a task when the scheduled appointment is for the morning. Well we did what we were told and then the wait was on! A few moments after his IV was removed he began his attempt to eat the lunch that was provided, mac-n-cheese, green beans, and chocolate cake. He took a few bites of the macaroni and cheese and decided the chocolate cake was a better choice. He asked me why we couldn’t just leave. So I offered to get his nurse so he could ask her. He finished his cake and looked at the macaroni and asked me if we could get out of there and eat somewhere else. I said, “Sure, if you can put your clothes on and walk out of here, I will follow you.” So I gave him his clothes and he put them on. Still no sign of his nurse (though there were two nurse looking ladies sitting outside his door, working on a portable computer.) He got up and ventured to the in-room bathroom to check out his incision. Then he said, “Ok, let’s go.” But he started walking toward me, so I asked, “Well if we are leaving, why are you walking toward me?” To which he replied, “I am going to write ‘Thank You’ on my white board.” And he did. He then turned around and walked out (with his walker of course), with me following behind. A nurse who was on duty in the morning happened to walk by as we were leaving and kindly said, “sorry about the wait.” We assured her it was no problem, then head out the double doors of the hospital, to our car, and came home…laughing all the way! I swear, I think we have all gone mad. Well not Brian, he did encourage us to wait to be discharged; but he wasn’t there to stop us. Just a few minutes ago the hospital called (It’s now after 4:00p.m. ), I made sure to give the receiver to Cole so he could answer the call. Sure enough it was his nurse. She said, “You weren’t supposed to leave; I didn’t even get a chance to check the incision!” He assured her he would follow up with his primary care physician in a week, and apologized for leaving. Though he apologized, I can assure you he is not sorry. He has had his fill of being in the hospital…and I do believe, so have I! Love this shenanigan. Sometimes you just have to follow your own path (and hungry stomach) and do what feels right for yourself and cut through all the red tape. Laughter is the best medicine…for me at least! i was on the receiving end of the laughter as they left teh hospital. It was grea tto hear them both laughing. I did tell Cole to run out of the hospital do not walk. Much love to all the Bent family. Just added the photo, thanks for the suggestion Stace!